Dinnertime can be a straight up struggle around my house these days. The hour when food needs to be prepped for our evening mealtime seems to align perfectly with official toddler meltdown hour. In an effort to avoid a matching mom-meltdown, I keep a few tricks up my sleeve for speedy dinners. 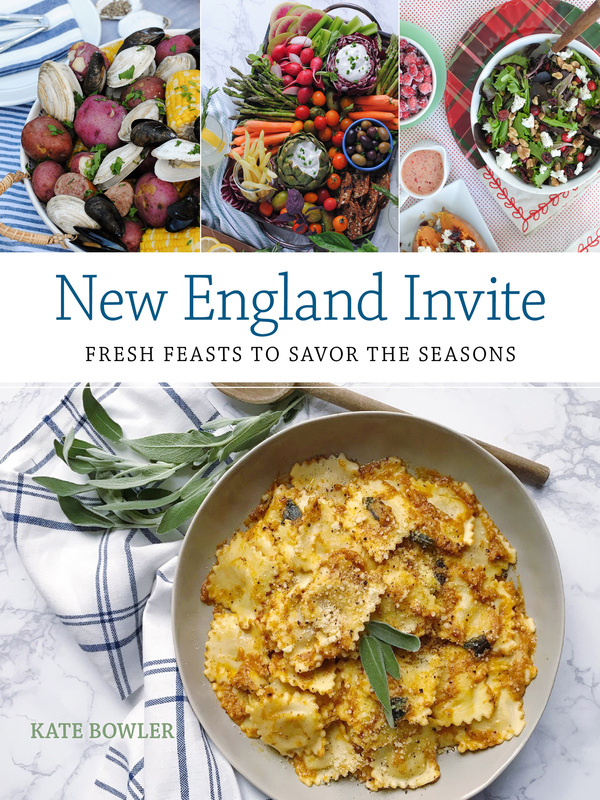 One of them, is adding a cooked rotisserie chicken to my grocery order from Peapod, and repurposing it in a few different meals throughout the week. 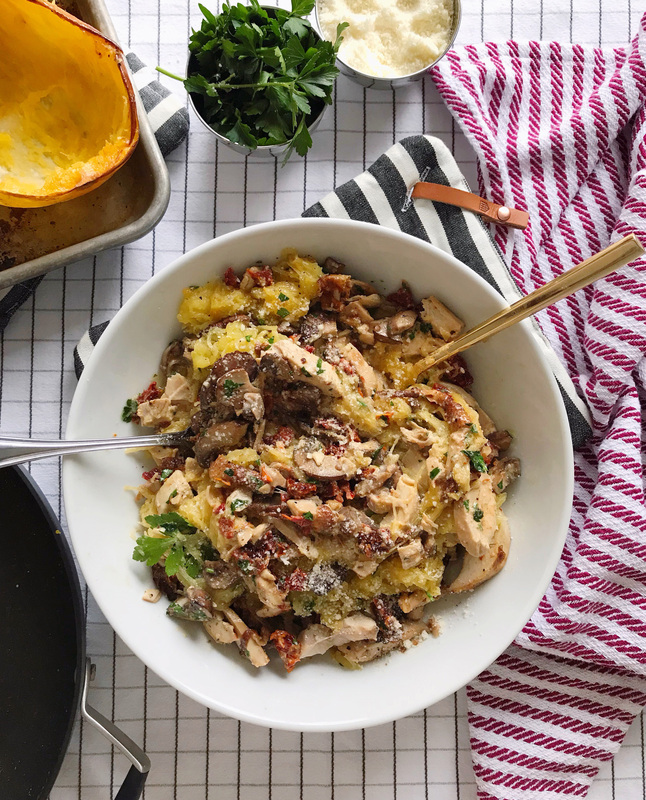 I thought I’d share a few of my favorite quick-fix ideas for using up leftover rotisserie chicken in the fridge today, as well as a brand new recipe I added to the mix recently while we’re on our New Year’s healthy eating kick. Each one of these ideas uses up about half a chicken, so you can pick two to mix and match for your weekly meal plan: Caesar Salad Bowls. This is the official dinner of “I don’t have time to cook” at our house. I chop up half of a rotisserie chicken and toss it in a big bowl with Caesar dressing and lots of cracked black pepper, and serve it with crispy lettuce, a few croutons, and a healthy heap of parmesan cheese. It’s a 2-minute dinner assembly that saves us on extra busy nights. Quick Pot Pie with Biscuits. Chicken pot pie, made from scratch, is a long and tedious dish to make. I take a short-cut approach for weeknight cooking and mix in a large pan: a few cups of chopped rotisserie chicken, a few cups of veggies (corn, peas, carrots, onions), and a half a can of cream of chicken soup mixed with a few drops of milk to make the sauce. While it’s coming together on the stove, bake off a few store-bought prepared biscuits in the oven. Ladle the chicken pot pie filling into a bowl and top it with some parsley and warm biscuits. Buffalo Chicken Mini-Pizzas. Pizza and salad are perfect quick-fix meal. Preheat your pizza stone so it’s nice and hot while you’re getting your ingredients prepared. Roll out the pizza dough, and then in a small bowl toss together chopped rotisserie chicken with butter, hot sauce, and scallions. Spread the buffalo chicken on the pizza and top it with mozzarella and blue cheese crumbles. A pizza in a super hot oven should only need to cook for 7-10 minutes, so it’s ready by the time you’ve assembled some salad greens with blue cheese dressing to match. Black Bean, Corn and Chicken Quesadillas. Using up leftovers is the name of my lunch game, and having some leftover rotisserie chicken in the fridge is the jackpot of ingredients. I’ll chop some chicken up and toss it with a few black beans, some frozen corn (microwave it to thaw it quickly), and a scoop of salsa. Then spoon the mixture into a tortilla with some cheddar cheese and crisp it up in a pan for a 5-minute quesadilla lunch. Bonus points if you have an avocado to slice up on top and some sour cream on the side. 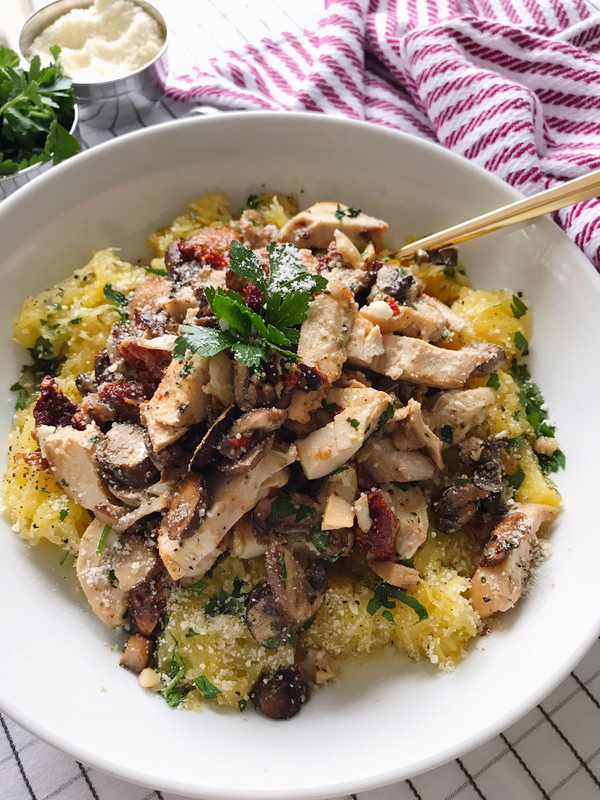 Sundried Tomato Chicken, Mushrooms, and Spaghetti Squash. 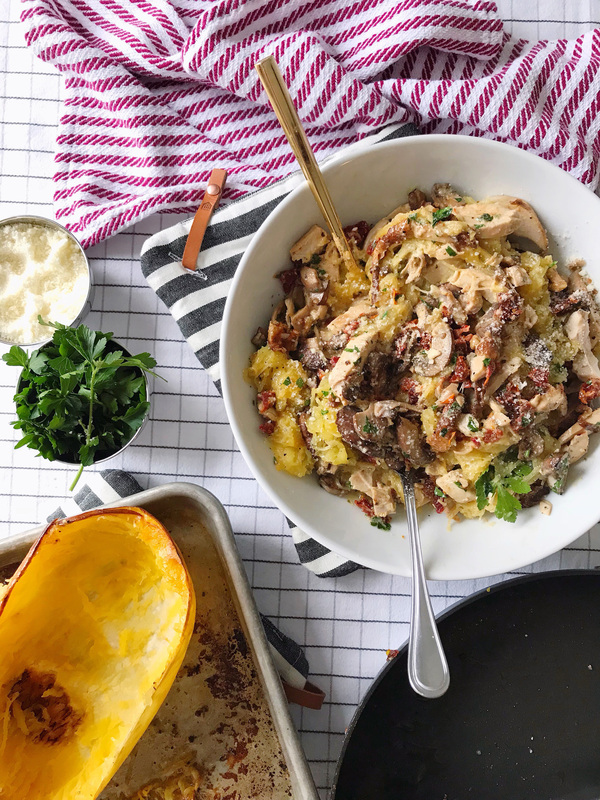 This recipe takes a little bit longer, because it involves roasting spaghetti squash. I turn on the oven as soon as I get home, get the squash roasting, and then have time to do a few things around the house like unload the dishwasher and set the table for dinner. Then during the last 15 minutes before the squash is done roasting you can assemble the rest of the ingredients and pour them over the spaghetti squash to serve it. I will not be one of those people that tells to you they barely notice the difference between spaghetti squash and really pasta. That’s just crazy. Real pasta is obviously way better, but I’ve been enjoying spaghetti squash recently as a healthier alternative to my love for heaping bowls of noodles. Get the full recipe for this dish below! Cut the spaghetti squash in half and remove the inner soft strands and seeds. Drizzle it with olive oil, season with salt and pepper, and then place the squash insides down on a rimmed baking sheet. Roast the spaghetti squash for 50-55 minutes. About 15 minutes before the squash is done roasting, begin to prepare the rest of the dish. Heat butter in a pan over medium heat, add minced garlic and chopped mushrooms. Sautee mushrooms with garlic and butter for 5-7 minutes. Stir in diced rotisserie chicken, sliced sun dried tomatoes, and cream. Cook for an additional 5 minutes until chicken is heated through. 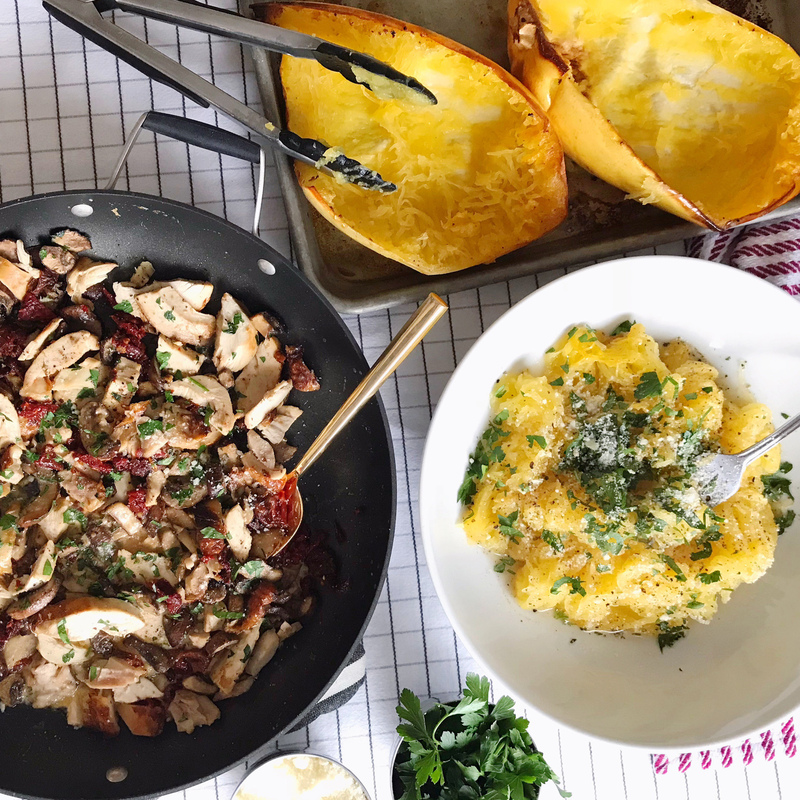 Remove the spaghetti squash from the oven and use a fork to shred the squash strands, transfer squash to a large bowl and toss with ¼ cup of parmesan cheese, 3 tablespoons of chopped parsley, salt and pepper. 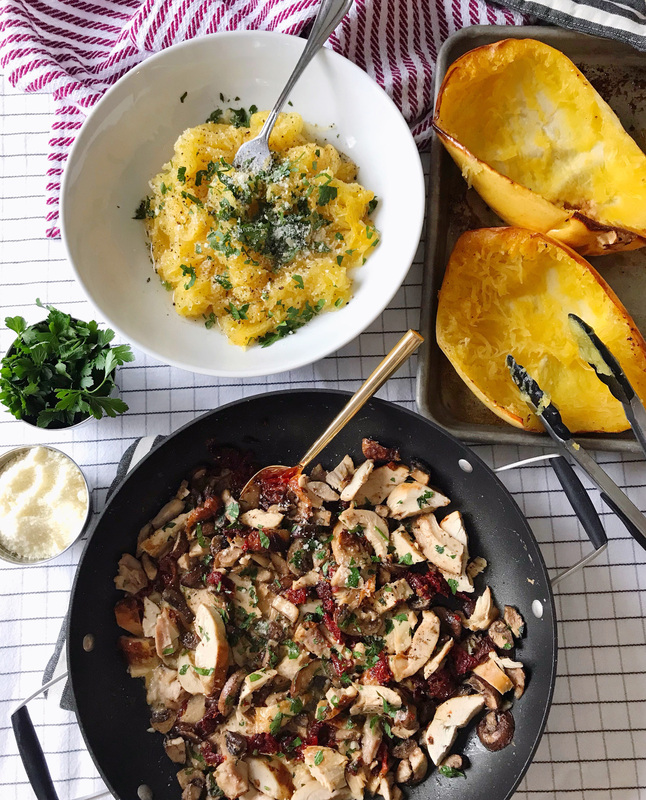 Pour the mushroom and chicken mixture over the squash and serve with additional parsley, pepper and parmesan cheese. PS: Great news! 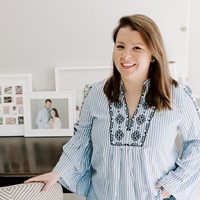 Peapod just lowered the prices on thousands of products, so you’ll see savings on your favorite items, and Peapod has introduced Bundles of Savings which groups together products that customers often buy together to help you save money. Ask Me Anything: Blogging Q+A. Ruby Red Carpet Cocktail. 3 Responses to "5 Easy Dinner Ideas with a Rotisserie Chicken." I needed more ideas on what to do with rotisserie chicken, so thank you!! Especially into that v. quick caesar salad recipe…yum! It’s such a good dinner-save, grabbing one when I’m short on time keeps me from ordering takeout! Just pinned this post to save for quick dinner ideas, especially post baby! These ideas all sound so yummy! Thanks for sharing Kate!